Marsha Aizumi and her son Aiden spoke about coming out of the closet at a recent conference called “Family: An API LGBTQ Gathering” [Lesbian, Gay, Bisexual Transgender, Queer] held on June 13 at the North Seattle College. It hasn’t always been so easy for Marsha to talk about coming out or the shame she admittedly felt when her transgender son Aiden first came out as a lesbian. Aiden later shared his desire to transition from a lesbian female to male. 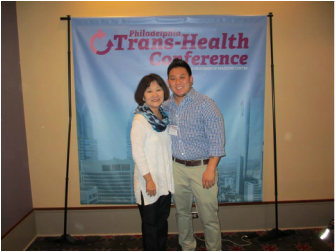 Aiden Aizumi, transgender activist, and his mother Marsha Aizumi shared their experiences in a presentation “One Family’s Journey: A Mother, Her Transgender Son and Their Journey to Love and Acceptance” as a part of Transgender Awareness Day April 30 in the Campus Center. In a nearly-filled ballroom of students, faculty, staff and administrators, the mother-and-son pair recounted their personal experiences of accepting and supporting Aiden Aizumi during his coming out and transition into a transgender male. “This is a very special day of awareness about transgender individuals, their families and their communities,” said Zandra Wagoner, University chaplain. Aiden Aizumi, senior liberal studies major, came out as transgender and started transitioning from female to male when he was 20 years old in 2008. He is currently a board member of Parents and Friends of Lesbians and Gays’ (PFLAG) National Transgender and Gender Non-Conforming Advisory Board and is an executive board member of PFLAG Pasadena. According to UCLA’s Williams Institute, 46% of transgender males attempt suicide, says educator, author, and lesbian/gay/bisexual/transgender (LGBT) community advocate Marsha Aizumi. For Aizumi, the cause is to fight prejudices faced by LGBT individuals. Ashley Aizumi didn't think she would live to see her eighteenth birthday. Since early childhood, she had been a "tomboy." In middle school she started to feel like she didn't fit in and began having panic attacks. In high school she came out as a lesbian but was bullied by her classmates and experienced rejection at her church. She began engaging in self-mutilation, or "cutting." Her panic attacks worsened, preventing her from attending school, and she was diagnosed with agoraphobia. Despite her challenges, she was able to complete her high school education from home, graduate, and get accepted to college. Arcadia >> Aiden Aizumi’s classmates won’t find him in 2006 Arcadia High School yearbook. Not unless they look him up as “Ashley,” anyway. “At the time, I was identifying as a lesbian,” said Aizumi, 25. When Aizumi was 13, he started to realize he was different from many of his peers. But his church was telling him something as well. For Clara Yoon, there was never any question in her mind about helping her daughter when she came out as transgender in 2010. Yoon, who is Korean American, quickly joined a local support group for parents of LGBT children. She soon discovered, however, that she was the only Asian parent in the group. “I am sure there are many parents that need support,” said Yoon, who founded the API Project of the Parents, Families and Friends of Lesbians and Gays of New York City (PFLAG NYC) last August. The group meets once a month, though Yoon says that to date those at the meetings have been mostly members of the LGBT community. The first Rainbow China Forum in Hong Kong brought together hundreds of gay rights activists, including parents, who vowed to keep fighting to protect their children. Parents of gay and lesbian youth are leading the charge for equality in China. As an avid NPR listener, I’ve learned to keep tissues in my car because, on Friday mornings, I listen to Storycorps and, well, I admit it… I often cry. Sometimes out of the joy of the connection of the two people and sometimes because of the struggles they have gone through to make it to that day. Personal stories are such a powerful link from one person to another. I'll tell you right now that you'll want tissues nearby when you listen to this month's Storycorps, recorded at last year’s Creating Change conference. Marsha and Aiden Aizumi are old friends of the Task Force and they have touched my heart and inspired me since the moment I met them. We awarded Aiden the Youth Leadership Award at our 2010 Creating Change conference for his work and leadership with PFLAG and the Trevor Project. His mom, Marsha, is a member of PFLAG’s national board for PFLAG and wrote a book about her journey with Aiden throughout his transition. On the heels of the National Day of Transgender Remembrance and as part of our work around transgender rights, we’re featuring the Aizumis' story of love, growth, family and activism. They are an inspiration to me personally and I’m so grateful that they’ve continued to bring their experience and their personal story to those who need to hear it. Tune in to Kauai's KKCR to listen to an interview with Marsha on August 26, 2013, at 8:15pm PST. From Darkness to Light: How a mother and her transgender son journeyed to love and acceptance. Four years ago, my 20-year-old daughter fearfully looked across a table at me and said the words that would forever change my life: “I want to transition to be a boy.” The first 20 years of my daughter’s life suddenly began to make sense: The toddler who pouted at wearing dresses and bows, the elementary school tomboy who only wore pants and T-shirts and the high school cutter who refused to go to school and was diagnosed with agoraphobia. She had struggled with her gender identity after coming out as a lesbian a few years earlier. She had talked with other femaleto- male transgender individuals, and their stories had resonated with her. In my mind, a volley of questions grabbed center stage: What do you mean transition to be a boy? Is it even possible to change genders? How? I tried to remain calm on the outside, but my mind was racing. A reflection on a mother’s journey as she accompanies her child’s transitioning from female to male and the place that church communities played in this journey. Also, this mother shares her hope for the future as more Asian LGBT families try to reconcile their spirituality with both the Asian and queer aspects of their lives. Marsha Aizumi’s book about her transgender son tells a story that is powerful on several levels. I had borrowed the book from my friend Harold Kameya several weeks ago, but had put it aside until we heard Marsha and her son speak at the JA National Museum a couple of weeks ago. Harold and his wife, Ellen, make a very strong supportive statement on the first page of the book. They are credited as being the founders of the L.A. Asian Pacific Islander Parents, Family and Friends of Lesbians and Gays (PFLAG). My wife, Marion, was so impressed hearing Marsha and her son, Aiden, that she had Marsha autograph her personal copy at the conclusion of their presentation. We spent the next few days sitting in our family room reading our own copies of the book, separately. 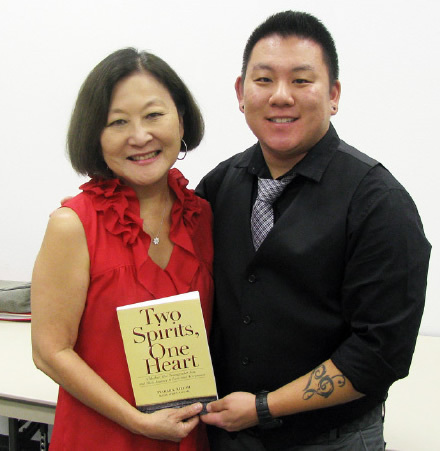 Editor’s note: I met Two Spirits, One Heart author Marsha Aizumi at an open house/media event that marked the opening of the L.A. Gay & Lesbian Center’s charter school for LGBT youth—a school Marsha played a pivotal role in starting. Since then, I’ve had several opportunities to hear Marsha talk about her transgender son, Aiden, and the struggles he faced as a young trans man. Whenever Marsha shares her story—whether she’s talking to a reporter or to me and a video crew for this Center video—she tends to tear up, either because it’s painful to contemplate some of the struggles Aiden has faced or, often, because she’s overwhelmed by pride for him. The book’s cover note describes it as chronicling “Marsha’s personal journey from fear, uncertainty and sadness to eventual unconditional love, acceptance, and support of her child…” I confess that when I saw that blurb, I thought irresistibly of Laura Z. Hobson’s semiautobiographical 1975 novel “Consenting Adult,” which recounted a mother’s 20-year struggle to come to terms with her son’s homosexuality. I first read “Consenting Adult” as a teenager a decade after it was published, and it already seemed to me, not only dated, but cheap — it seemed to ask readers to identify and sympathize with a mother going through such trauma, rather than with the son trying to come out in a difficult environment. You never know when you're going to be at the right place at the right time with the right message and knowledge ... and this is one of those rare occasions. A couple of years ago, Joe Bodell and I did a social media training at The Courage To Change Conference. I think it was on a Saturday in January. Marsha Aizumi and her transgender son share their emotional journey. 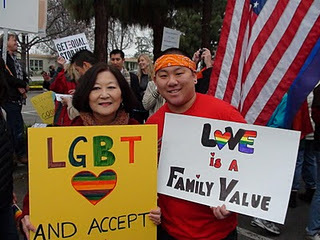 Marsha Aizumi and her transgender son, Aiden, addressed a Japanese American audience to educate the public and to raise awareness of LGBT (lesbian, gay, bisexual, and transgender) members of the Asian community on Sept. 14 at Faith United Methodist Church in Torrance. The presentation, “A Mother, Her Transgender Son, and Their Journey to Love and Acceptance,” was hosted by the Greater L.A. Singles Chapter of the JACL. Marsha Aizumi is an educator and advocate for the LGBT community, a cause she embraced due, in large part, to the harassment and bullying her transgender son experienced throughout high school. As a loving parent, along with her husband Tad, to two sons, Aiden and Stefen, her vision is to change school cultures to be more accepting of all students, as well as bring greater resources to the Asian Pacific Islander and transgender community. 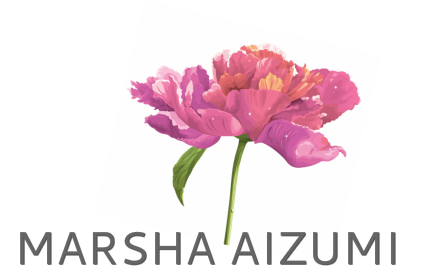 Our guest blogger today is Marsha Aizumi, mother of two children, Aiden and Stefen. She is the author of Two Spirits, One Heart: A Mother, Her Transgender Son, and Their Journey to Love and Acceptance, due to be released by Magnus Books in September of 2012. She was recently elected to the PFLAG National Board of Directors. In September, GLAAD spoke with Marsha Aizumi regarding her upcoming memoir Two Spirits, One Heart, written with her son Aiden. The memoir explores Marsha’s journey to embracing her transgender son and becoming an advocate and ally for LGBT youth. Recently, GLAAD caught up with Marsha and Aiden, discussing their respective work in advocacy, particularly for LGBT youth, and their experience as a family that has grown closer together through change. Earlier this week, I had the chance to speak with Marsha Aizumi, who is putting the finishing touches on her new memoir, Two Spirits, One Heart, the story of her journey to accepting, loving and supporting her transgender son, Aiden, unconditionally. Andrea Simon – She became a graduate student in creative writing at age 65. George Wolf – In his early 80s, he reinvented himself as a marketing director for a nonprofit that helps Holocaust survivors. James Vaughn – A former truck driver, he found meaning driving a school bus for special needs kids. Lynne Juarez – A retired schools administrator, she fulfilled a dream by traveling the world to train future teachers. Some in the transgender community nationwide say more resources and visibility are needed. Growing up in California, Aiden Aizumi did not always feel comfortable with the role he was born into. Adopted from Japan with his brother, Stefen Lawrence, Aiden Aizumi grew up in Arcadia, Calif. He was born as a girl in Japan, and named Ashley Akemi. But in 2008 he would openly express his desire to transition to a male. My oldest child was born female. Today he lives as a man. For 20 years, he struggled to align his physical body with his core being. I watched that struggle and I saw his pain, but I didn't know how to help my son. His own mother did not know what to do. The man that lived inside of him screamed to be recognized. He tried to ignore this male voice, but the voice could not be silenced. The divisive decision by Mayor Amundson to bring Focus on Family’s H.B. London to Arcadia in March is having some significant repercussion in the community. Q: What fed your decision to write Two Spirits, One Heart? how much knowledge did you have of these issues? overt hostility—and fear — that so many seem to carry? A Harassment-Free School Opens In L.A.
Aiden Aizumi almost didn't graduate from high school. LGBT High School Program Begins in L.A. The L.A Gay and Lesbian Center in Los Angeles has added a new service: now, in addition to housing, job placement, health, and other areas of assistance, the center provides a safe educational environment for LGBT students.